Young freelance web developer Jonathan Zornow, with no previous background in robotics, manufacturing, or the apparel business, has succeeded in revolutionizing the clothing business! His project, Sewbo, recently demonstrated the world’s first robotically sewn garment, and the inspiration came while watching a late-night Science Channel show called How It’s Made. Zornow got stuck asking why there weren’t robots there to perform the stitching, and what clicked for him while watching the show was the realization that getting robots to handle the complexities of a material that bends is difficult. I'm pretty sure that this would work very well for bespoke clothing kiosks. 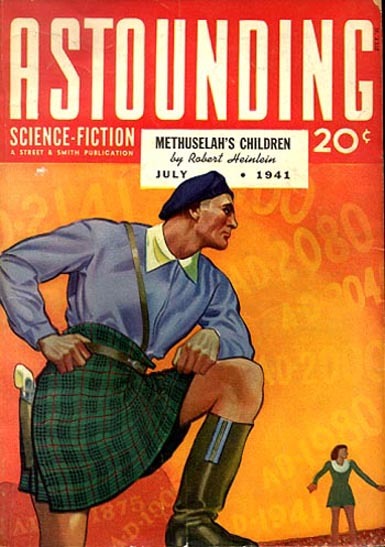 Robert Heinlein had in mind in his 1941 novel Methuselah's Children. On the run from the authorities, Lazaras Long needed a change of clothing - right now.